We make roof installation a simple, beneficial process. When you need a new roof, it can be very overwhelming. First, you have to come up with the money to pay for it and then you need to find a reputable company to do the job. Finding a great company to work with for roof installation can be easy if you decide to hire us at Slippery Slope Roofing. We have been in the roofing business for quite a while and we bring over 50 years’ worth of experience to all of our jobs. We specialize in roof installation for new homes, existing homes, and commercial buildings. No job is too big or too small for us. All of our roofers are expertly trained and are very hard workers. We are committed to providing excellent customer service and will work closely with all of our customers to make sure they are satisfied with every step of the roof installation process. One of the main things that sets us apart from our competitors is that we only work on one roofing job at a time. We finish a job from start to finish before we tackle another project. This gives us the ability to concentrate on giving our customers our full attention. It also allows us to focus on your roof installation without distractions or emergencies from other job sites. As an added bonus, we provide all of our customers with peace of mind by being fully licensed and insured by the WSIB. This means that if something were to happen during your roof installation, we would carry all the liability. We are also accredited by the Better Business Bureau, so you know that you are working with a company that can be trusted and has a good reputation. 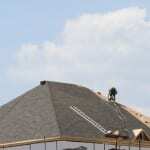 Roof installation is easy with us at Slippery Slope Roofing. If you are in the Midhurst, Ontario area and need a new roof, give us a call today.